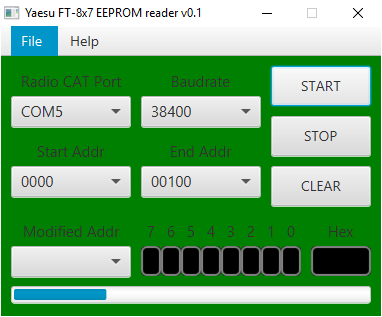 This is a very simple to use multi-platform Java application which can be used to find EEPROM locations for different transceiver settings. This information can then be used to send the right CAT commands to configure the radio remotely. Select START and END address for changes scanning. An initial scan is done for the full address range to save in the cache current values. You can select serial port configuration (Baudrate, DTR, RTS signals). 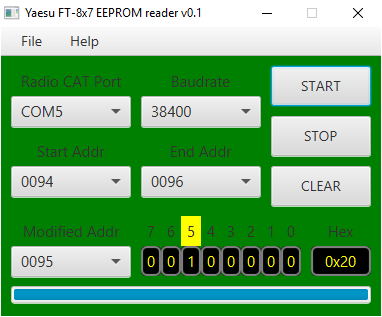 For each consecutive scan if the content of an EEPROM address is changed, the respective address is added to a list, latest one being always the one selected. You can select from a dropdown list the changed address of interest and display the content in a binary format. Changed bits are marked with yellow. At any time, you can clear the content of the changed addresses list without stopping the scan. This can be used to better detect only the bits of interest or to (re)check detection. Information about the changed data (with timestamp) can be saved in a text log file. Use this application on your own risk. Even if no data is written back to the EEPROM, I am not responsible for any possible undocumented effects of reading the EEPROM. The package is a zip archive containing a single file: ft8x7ee.jar. Unzip the file in a new folder of your choice. At first start, a configuration file (ft8x7ee.cfg) will be automatically created, where the application configuration data will be saved. The Radio CAT port your CAT cable is using. The Baudrate (for speed, better use the higher available for FT8x7, which is 38400. Take care that the same Baudrate is configured for CAT in the radio menu. Because FT857/897 does not have any data for addresses higher than 1249 (hex), this is the last address you can configure. If your CAT interface require specific settings for the RTS and/or RTS signals, you can configure this from the file menu. Checking “RTS Power” and/or “DTR Power” will put respective signals to 1. Some of the radio parameters are stored in the 0000-0100 address range, so you can start first with this range. After selecting START and END address, press on START button to start an initial scanning. A progress bar will be seen in the lower part of the form. When finalized, a message will pop-up and the scan will be paused. Change one setting only and click “OK”. Let’s take for example Menu Mode nr. 061, MTR ATX SEL. This is used to set what parameter will be shown on the external analog meter. Default value was SWR. Now change it to PWR. 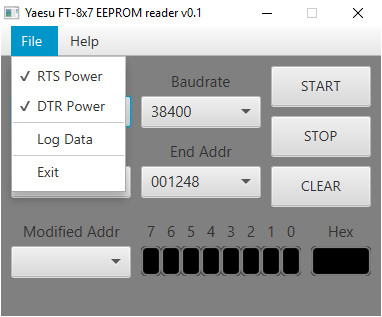 Exit the settings in order for the new parameter to be saved in the EEPROM. You will see that 1 location was changed: 0095. As you can see, bits 6 and 5 were changed to ‘00’ for PWR mode, so the previous value (for SWR) was ‘11’. To speed up the process, click STOP then CLEAR. Select START address 0094 and END address 0096 and then click again on START. Wait for the cache to be updated and then change again the parameter to ALC. 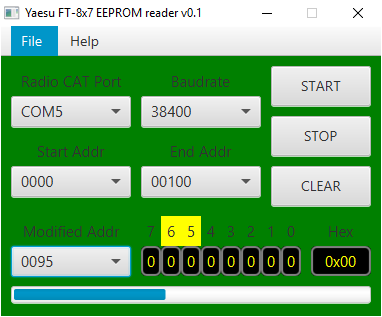 Do not forget to exit the menu in order to save the new value in the EEPROM. You will see the new values. Note the value for ‘ALC’ as ‘01’. Do the same for ‘MOD’. You will get the value ‘10’. Now do the same for ‘VOLT’. You will see that this time bit 7 will be changed from 0 to 1, and bit 6-5 to ‘00’. Repeat procedure to get the values for ‘N/A’ (‘101’) and ‘OFF’ (‘110’). 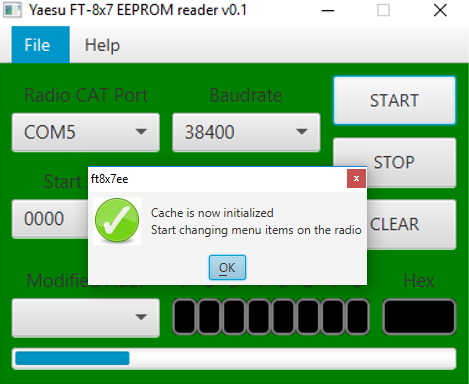 Based on the findings, you can now create commands in Pocket RxTx for your specific radio. 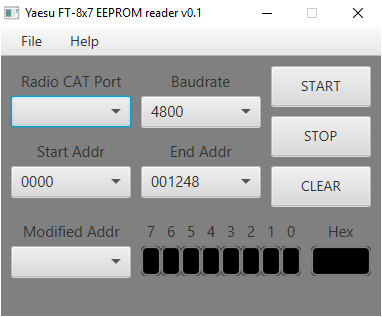 IN my situation is about an FT-857, so add the following in the ‘yaesu_ft857.radio’ configuration file. 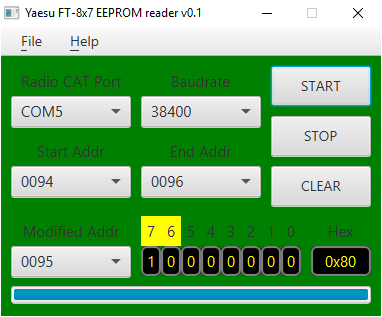 Because usually even addresses are used (The read/write commands read/writes two consecutive EEPROM addresses), we will use the write command at 0094 instead of 0095 and modify the second byte.